It is hard to imagine card collecting without Sy Berger. While baseball cards were around before he came into the picture, Berger was directly responsible for setting the standard for card that remains today. 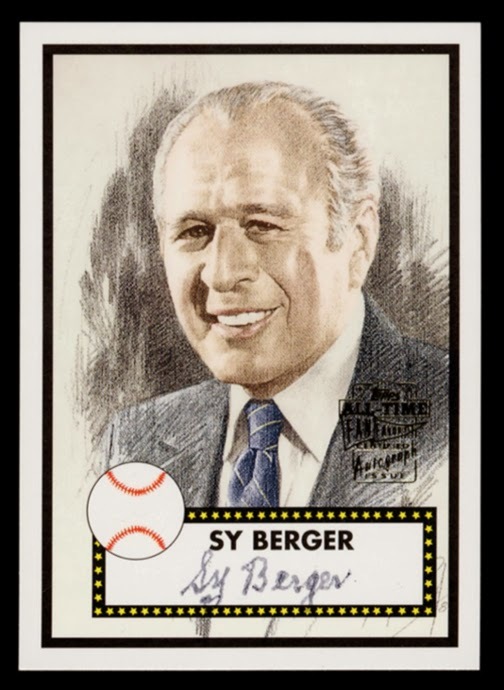 As co-designer of the 1952 Topps Baseball Cards, Berger took all the elements that had existed before, stats, facsimile signatures, team logos, player pictures, etc and combined them onto one card. He even went on to set the standard size for all cards, 2 1/2 by 3 1/2 inches. Here is a fantastic segment Keith Olbermann did that spells it all out. "What can I say about Sy Berger? He was my long-time friend. He helped me from my first days in the majors. I never could have made it without him. He always knew the right thing to say or the right thing to do. We worked together. We laughed together. We grew up together. What I can say to you is, 'He was my friend.' What I would say to him is, 'So long old pal.'"